It’s no secret that soup tastes extra great during the cooler months. 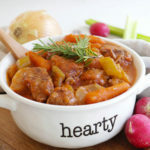 This Keto Beef Stew Recipe is perfect for any week or weekend night. You can prep even prep it ahead of time for a gathering or so you can have a weeks worth of delicious stew. Serve it up solo or over a bed of cauliflower mash. Whatever you choose you won’t be disappointed. There’s nothing worse than feeling like crap or coming down with a cold. The good news is that with each bite of this soup, you’re replenishing and fueling your body by boosting your immune system. Asides from giving you something to cry about, onions are actually great for immune health. They contain a myriad of benefits and have key nutrients such as vitamin C and zinc. Both of these nutrients play an important role in keeping your immune system in check [*][*]. Speaking of onions, garlic (which is actually a family member to the onion) contains antiviral, antifungal, and antibacterial properties. Garlic, when crushed, releases a pungent smell. This is known as allicin and it’s garlics defense mechanism to keep away the bad guys. So naturally it makes sense that consuming garlic, especially crushed garlic, will help fight off cold or flu symptoms, keeping your immune system functioning at its best. Fun fact: Vitamin k2 plays a major role in protecting your calcium stores by keeping it on its right path. If your body doesn’t get adequate amounts of vitamin k2, it won’t really know what to do with calcium and therefore dumps it just about anywhere, including your arteries. Doesn’t sound great, does it? So what can you do to prevent that? Well, by consuming more foods loaded with vitamin k2. Insert grass-fed beef. This stew is loaded with a healthy dose of it, coincidentally. But consuming too much protein will for sure kick me out of ketosis, right? That couldn’t be farther from the truth. Contrary to popular belief, excess protein will not turn into sugar in your bloodstream through a process called gluconeogenesis, subsequently knocking down your ketone levels and kicking you out of ketosis. That’s just a myth. Gluconeogenesis actually plays a key role when you’re in ketosis. It’s the creation of glucose from anything but carbs. Even when you’re on a low carb diet, you need glucose to survive. Too much glucose is a problem, yes, but too little glucose is a problem, as well. Grass-fed butter also contains vitamin k2 and may be one of the best sources of it. That’s why it’s so important to choose grass-fed over grain-fed. Grain-fed lacks the significant health benefits that grass-fed has to offer. Grass-fed > Grain-fed. Remember that. Studies have shown that consuming foods high in vitamin k2 help reduce the risk of plaque build up (atherosclerosis) and heart attacks [*]. Not only does Bone broth contain a healthy dose of electrolytes and essential nutrients, such as magnesium and calcium, it also contains amino acids such as glycine and proline. Studies have shown that an abundance of glycine and proline has been linked to a reduction in inflammation and joint pain [*][*]. Celery it the perfect addition to any savory keto meal. It’s satiating, hydrating, and full of health benefits, one of them being lowering inflammation. It helps by combating oxidative stress and fights free radicals due to its antioxidants and polysaccharides that act as anti-inflammatories [*]. Celery also contains flavonoids like quercetin. There have been multiple studies that have shown quercetin to have vast anti-inflammatory properties, especially helping those suffering from osteoarthritis and other joint-related issues [*]. Now you have something to think about the next time you scoop out a delicious portion of this soup. Press SAUTE function +10 minutes on Instant Pot. Melt butter. Add meat and brown for 3-4 minutes. Its best to brown meat in a few small batches to get the best color. Stir in vegetables and batches of meat that were previously browned. Stir in tomato paste. Add broth, salt, pepper, and xanthan gum to pot. Stir well to combine ingredients. Turn Instant Pot OFF, then press STEW function +40 minutes. When timer goes off, manually release steam. Sprinkle and stir in very small amounts of xanthan gum to desired consistency. Garnish with fresh parsley to serve if desired. If you don’t have an Instant Pot have no fear, you can do this in a slow cooker as well. Simply add all the ingredients in to the slow cooker, stirring until well-combined, and then cook on low for 8 hours. Made it- yum. The whole family liked it. I doubled everything except the broth (did not have any more room in my slow cooker!). Turns out 3 cups of bone broth was plenty to make it stew like. I also omitted xantham gum- its not necessary imo.